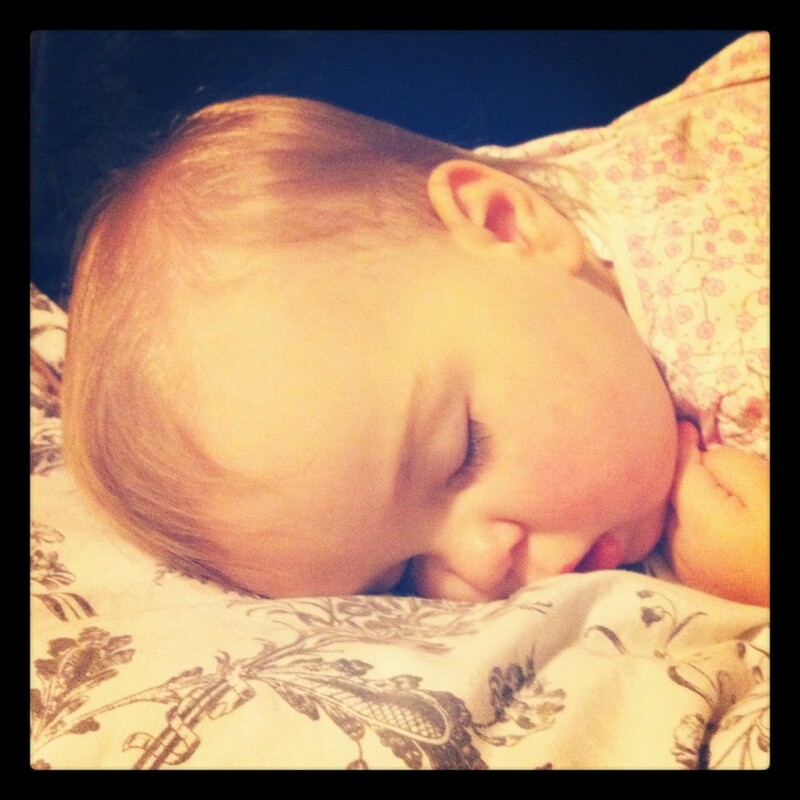 My beautiful, sweet, energetic, smart, almost-two-year-old just will not sleep through the night. And by sleep through the night, I mean even a four to five hour stretch. This was the morning after the first and only night Mackenzie has ever slept through the night completely — January 16, 2012. Doesn’t she look so peaceful? And rested? We need more of this. Way back when Mackenzie was just a few weeks old, a sweet friend of mine and very wise mommy suggested I read Marc Weissbluth’s book, Healthy Sleep Habits, Happy Child. I did, and I have continued to try to follow its advice since then. That said, we have tried Weissbluth’s sleep training strictly, Weissbluth mixed with our own methods, Sears, and a variation of the Baby Whisperer technique. We’ve had a consistent bed/bath/story routine since she was about eight months old. She has always been an early riser, usually waking up around 6:30. Bedtime is no later than eight. She takes one two and a half hour nap each day from about 11:30 – 2:00. Nothing, absolutely nothing is working. There was one glorious night back in January that Mackenzie actually slept through the night. I have a picture of her fast asleep. So glorious. I don’t think she had weaned yet, though — that changed so many things. There is a good chance she is teething her two-year molars, and if that’s the case, son of a gun. What a bear. I’m worried it’s more than that. That it could be medical. Another ear infection, maybe? She just finished her antibiotics for the last one on Friday. Or allergies? She had some strange welts on her hiney after eating mixed nuts at the zoo the weekend before last, so we have cut those out of her diet. I’m worried it could be emotional. She’s in daycare all day, and as much as I hate that, it’s a quality program, and her teachers love her to pieces. I call at least once a day to check in. I really don’t think anything is going on at school, other than that she just misses me. She is very, very attached to me — which is wonderful, except that it is very hard to put her down when we’re at home together, especially during the week. She also won’t let her Daddy soothe her, and that is very hard for him. Heck, it’s hard for me, too. So any advice? I am open to suggestions! Or even just a bit of commiseration. Any other exhausted parents of a toddler out there? No suggestions, but I do have some commiseration. I’m the exhausted parent of a newborn. And I should probably be sleeping right now while she’s napping! Someone told me the other day that there’s a reason that sleep deprivation is a form of torture. And boy oh boy do I believe it! I wish I had a magic solution. I really really do. All three of my kids have slept SO differently, and I wish I could say that doing the same things worked for every one. But alas, it didn’t. Some babies just wake up a LOT until they hit a magic age and then BAM, totally fine. Thanks, Keli! For a while there, it was full blown screaming crying. Lately, it’s more whining and hollering. I ignore it for about ten minutes, and most of the time, it’s a wet diaper. I’m even using the Huggies Goodnites diapers. My girl has always been a heavy wetter. I wonder if you can double up those things?? We’re trying to wean her off of any night-time milk sippies, but if she doesn’t eat a good dinner, she wakes up hungry, then wakes up with a wet diaper a few hours later. We are trying to break the cycle, starting with getting a toddler to eat a good dinner. It’s very hit and miss. Tips? ?